On Friday, while Biplab Deb was being sworn in as the new Chief Minister of Tripura, the social media went frenzy when a video, showing PM Modi ignoring LK Advani, went viral. While walking down to the podium, PM Modi responded to everyone's greetings separately but ignored his ‘mentor’ LK Advani. Amit Shah, Rajnath Singh and MM Joshi were a few of the leaders present at the event. After Bharatiya Janata Party (BJP) swept the majority of seats in state of Tripura, Biplab Deb was sworn in as the new Chief Minister of the state. During the swearing-in ceremony of the leader, some BJP stalwarts like LK Advani, Amit Shah, Rajnath Singh and Prime Minister Narendra Modi were also seen on the stage during the swear-in. Apart from BJP leaders, former CM of Tripura, Manik Sarkar, was also seen on the stage. However, what caught everyone’s eye was how PM Modi ignored his one-time ‘mentor’ LK Advani who stood up to greet PM Modi. According to reports, as soon as PM Modi arrived on the stage all the other leaders stood up from their places in order to greet the Prime Minister. While walking down to the podium, PM Modi responded to everyone’s greetings separately. He was even seen sharing a few warm words with the former Chief Minister. However, while campaigning for the elections, PM Modi had unleashed brazen attacks on Sarkar’s government. Apart from all this, something that actually made people get up from their seat was how PM Modi had allegedly snubbed the BJP veteran, LK Advani. In the video clip that was shared by a news agency, PM Modi was seen walking past LK Advani without responding to his greetings. 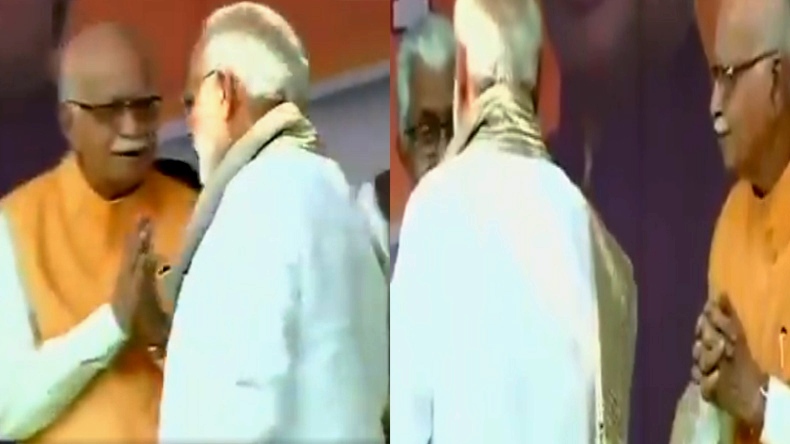 In the viral video, PM Modi completely ignores Advani who was seen standing beside Manik Sarkar. It was also seen that BJP veteran kept standing in the same position and followed him through his eyes as he ignored him. As expected the instance didn’t go well with the social media users. As the video was shared, several users expressed their sorrow that how and PM Modi ignored Advani, who he used to laud at almost every single address. Jo pidi hote h unko ni karte..Phele dekho kitne congressi pm modi ki respect krte h.. Tab baat krna..
आडवाणी जी पिद्दी है??? मूर्ख एक अनपढ़ चाय वाले के चक्कर मे अपने पार्टी के दादा को ऐसे बोल रहा है? this is how God punishes you for your sins. look at Advani, the mentor of Modi, standing there like a discard tht Modi doesnt even like to talk to. he's being insulted so brutally. Modi will also face similar fate soon.